If you like my work or have suggestions, please rate my photos, leave comments, tell your friends, link to me in your blogs, and "Like" LDS Temples by Busy Bumble Bee Photography on Facebook to help spread the word. My Bee Square products are currently found at the Lion House, The Nauvoo Cafe and the Museum of Church History and Art, all surrounding Temple Square. 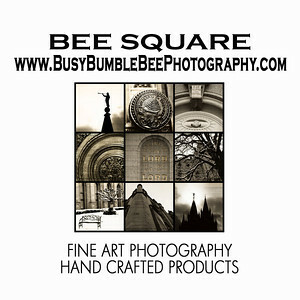 If you like my work, ask your local store to carry my Bee Square products. Refer them to my site or let me know if you have any contacts to facilitate getting my work to a greater audience. Thanks! !